Paleontology, put simply, is the study of prehistoric life. This includes the history of the earth, the organisms in it, as well as their evolution, and their interactions with other organisms and the environment. It is a historical science, meaning it describes the past and its causes as opposed to physics which performs experiments to learn the effects. Paleontology is difficult to distinguish from archeology. Archeology is the study of human remains and civilizations, while paleontologists study human evolution and the effects that the environment had on early humans. The two are separate but frequently overlap. Paleontology is also in-between the sciences of biology and geology as it uses many elements of both. Paleontology uses many sciences as part of its study. For instance, a paleontologist might study ecology through ancient plant samples, or he/she might study the chemistry of fossils or rocks to determine the environment of the earth at that time. It is obvious that Paleontology is a wide spread science, but it also contains subdivisions such as Paleobotany, the study of prehistoric plants, or Biostratigraphy, the dating of fossils in relation to other fossils around it. Paleontologists study both body fossils and trace fossils. Body fossils are perhaps the most informative and include fossils like dinosaur bones, old seashells, and other skeletons. However, body fossils can be somewhat biased. In order to fossilize well, an organism must usually have a hard skeleton, shell, or otherwise durable body part. It is almost certain that many organisms existed that have never been found fossilized because they didn't fulfill these prerequisites. Paleontologists also study trace fossils which are evidences of an organisms interaction with the environment. These can include footprints or teethmarks. Paleontologists also study the geochemical properties of fossils and rocks to determine evidences of micro-cellular life as well as the climate of the time period. This is a study shared with Geologists. For example, deposits of iridium found at the Cretaceous-Tertiary boundary highly suggest that dinosaurs became extinct due to a large meteorite impact or volcanic activity. After these evidences are collected an attempt is made to date them. They can be dated relative to other fossils or given an absolute date based on the decay of certain elements contained in the fossil. A paleontologist collects all the data they can from these fossils and other evidences, then attempt to classify them. There are two methods of classification, the Linnaean system and the more widely used cladistics. The Linnaean system has a set number of levels that an organism can be classified into. This presents limitations however, and is not widely used by paleontologists. Using cladistics a paleontologist can draw a variation of a genealogical tree showing the evolution of the organisms and tracing them through time. 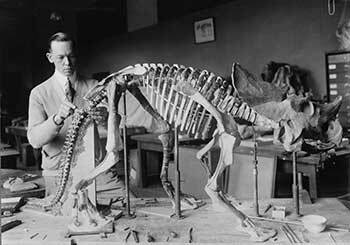 Although paleontology did not become an official practice until the early 1800s, some evidences of early paleontology exist. The Ancient Greeks hypothesized, because of fossilized seashells and other fossils, that some areas of land were previously under water. But it wasn't until the late 1700s that fossils began to prove that some animals had existed long ago and had become extinct. This lead eventually to the study of these evidences and the emergence of Paleontology. In the 1800s many advancements were made and an increase of interest led to many museums and displays. The geological timescale was invented based on evidences in the layers of the earths crust. The word "paleontology" was officially coined in 1822 by Henri Marie Ducrotay. Advancements continued with Charles Darwin's Origin of Species in 1859 and the theory of evolution. Since then, we have continued to fill in the blanks and learn more and more about our earth's history.